It’s quite a sight! Haverford’s arboretum campus is beautiful year round, but never more so than on Pinwheel Day. Visit the Haverblog to learn more about the Pinwheel Day tradition. Visit your reunion class page and check out the schedule of events. There’s not really a road map for success as a non-classical cello player and composer, so Nick Takénobu Ogawa ’05 has been making his own path, one instinctual step at a time. Ogawa has been playing shows and releasing recordings under the nom-de-music Takénobu since he graduated from Haverford. Read "Mixed Media: Music" from the Winter 2019 issue of Haverford Magazine. The senior thesis represents the culmination of a Haverford student’s academic experience, and is one of the most important and rewarding ways that Haverford realizes its educational mission. It is an opportunity to do original research at levels usually reserved for graduate students, in partnership with faculty mentors. 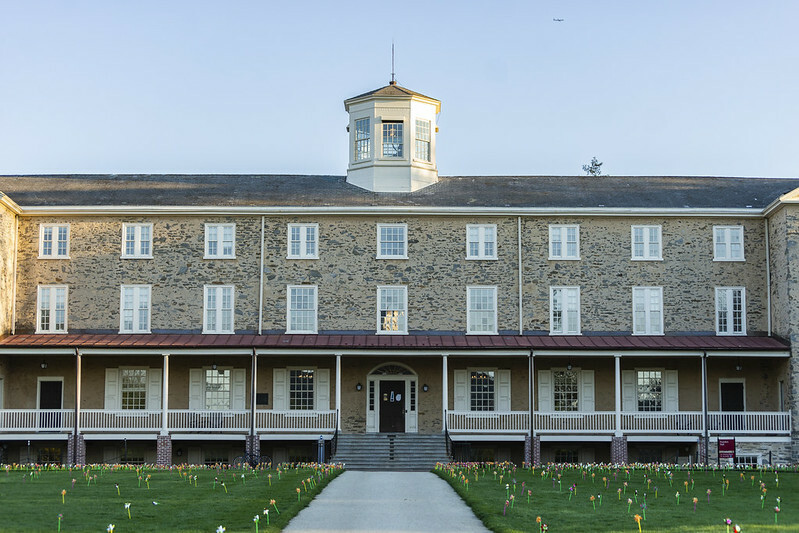 Haverford College is one of a very few institutions in the country that includes a senior thesis project as part of every student’s academic program. The Haverford Innovations Program (HIP) encourages and supports creative and strategic thinking around a problem, a need, a question, or simply an interest. The goal is to find new solutions and opportunities for entrepreneurial projects and paths of learning. Deputy Director and Chief Curator of Brown University's Haffenreffer Museum of Anthropology Kevin P. Smith '81 and his colleagues analyze compounds from animal bones to reveal climate conditions in the distant past. Read "Collecting Ancient Climate Data" from the Winter 2019 issue of Haverford Magazine. Photo by Stephanie Alvarez Ewens. Part of the Haverford Libraries’ Dime Novel Collection is a complete set of the 100 volumes of Beadle’s Frontier Series, which were originally published from the 1860s to the 1880s and were purchased in part to honor Emeritus Professor of History Emma Lapsansky-Werner on her retirement. "In the Collection" highlights some of the rare and marvelous items that are part of Magill Library's Special Collections. Lapsansky-Werner has used them to teach her writing seminar “The American West in Fact and Fiction.” Librarian of the College Terry Snyder has also used them in her “Materiality and Spectacle” class, and Sarah Horowitz, curator of rare books and manuscripts and head of Quaker and Special Collections, uses them with classes looking at book history and technology, as an example of mass-produced, inexpensive books. Photo: Dan Z. Johnson. Read Office Hour in the Winter 2019 issue of Haverford Magazine. Ariana Huberman's office in Hall building includes art, photos of her family, and copies of her book Gauchos and Foreigners: Glossing Culture and Identity in the Argentine Countryside. Photo: Patrick Montero.